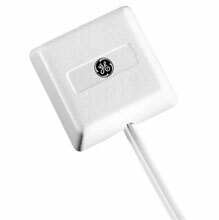 The 5150W Glass Shock Detector is a new line of glassbreak sensors with improved aesthetics. Its clean design makes the detector one of the most low profile sensors in the industry. Advanced piezo transducer technology powers the sensor, so no power is needed from the loop. Instead, the piezo generates its own electricity when it bends as the glass breaks. Bending of the transducer must occur for the sensor to go into alarm providing excellent false alarm immunity.